Nutlin-3a activates p53 and its target genes in PEL cells. 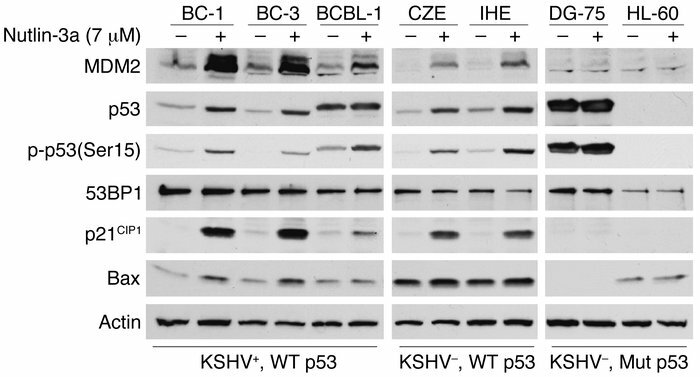 KSHV-infected PEL cells (BC-1, BC-3, and BCBL-1), EBV-transformed LCLs (CZE and IHE), and cells with mutant p53 (DG-75 and HL-60) were incubated for 12 hours in the presence (+) or absence (–) of 7 μM Nutlin-3a. Whole-cell lysates were subjected to SDS-PAGE followed by Western blotting and analyzed for p53, MDM2, phosphorylated-p53(Ser15) [p-p53(Ser15)], 53BP1, p21CIP1, and Bax expression. Actin immunoblot is shown as a loading control.